Product prices and availability are accurate as of 2019-04-16 04:46:00 UTC and are subject to change. Any price and availability information displayed on http://www.amazon.com/ at the time of purchase will apply to the purchase of this product. 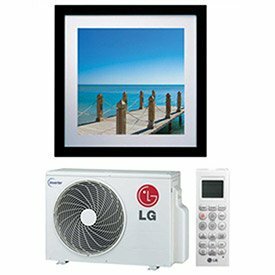 The LG LA120HVP Ductless Air Conditioning SingleZone Art Cool Picture Mini Split System with Heat Pump is a high efficiency, wall mounted AC unit, with heat pump inverter included. Among many features, it has an auto changeover, low ambient standard, variable speed compression inverter, a dehumidifier and self cleaning coil.This unit is an energy saving and efficient choice from LG, as it qualifies for the Energy Star Tax Credits for Consumer Energy Efficiency. The LG LA120HVP Ductless Air Conditioning SingleZone Art Cool Picture Mini Split System with Heat Pump is an ultra quiet, attractive and noninvasive ductless system that works very much like a central air system, without added expense or unsightly ductwork.As an Art Cool model, this unit will complement the decor of your home with its mirror finish design. And with the recommended proper installation by a professional, your unit will function at its best and last for years to come.LG is known as a leader in ductless air conditioner minisplit systems. A ductless split system is similar to a central air system; however, this system is unique. It is a split (2part) design. It comes with an indoor air handler and the noisy condenser which is installed outside. You no longer need expensive and invasive ductwork. It only requires a 3" opening in the wall or ceiling, and installation is easy. Simply mount the indoor and outdoor units, connect the refrigerant lines, and make a few electrical connections. Most installations can be done in a day. 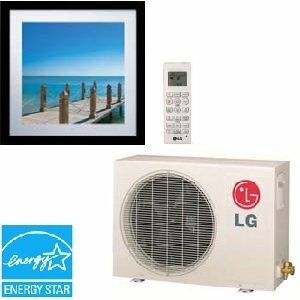 LG supports and recommends that a qualified air conditioning contractor properly size and install LG DuctFree (ductless) air conditioners for optimal performance and long life.Ductless air conditioning systems have been around for several decades and are a proven technology to heat and cool rooms at a fraction of the cost of baseboards and wall heaters.